PIERRO (AUS) (Bay 2009-Stud 2013). 11 wins-6 at 2, ATC Golden Slipper S., Gr.1. Leading Aust. First Season Sire in 2016-17. Sire of 209 rnrs, 113 wnrs, 13 SW, inc. Levendi (ATC Australian Derby, Gr.1), Arcadia Queen, Pinot, Pierata, Action, Tulip, Arcadia Prince, Roy Had Enough, Commander, I Like it Easy, Satin Slipper, Kentucky Breeze, Octabello, SP Sikorsky, Aeecee Tong De, Furore, Poseidon's Pool, Rainbow Girl, Regal Power, Femme Fireball, etc. Cruze (g. by Pierro). Winner. See below. Leuluai (g. by Sepoy). Winner at 1950m in 2017-18, 2d Otago RC KB Contracting H.
DARIANA (Redoute's Choice). 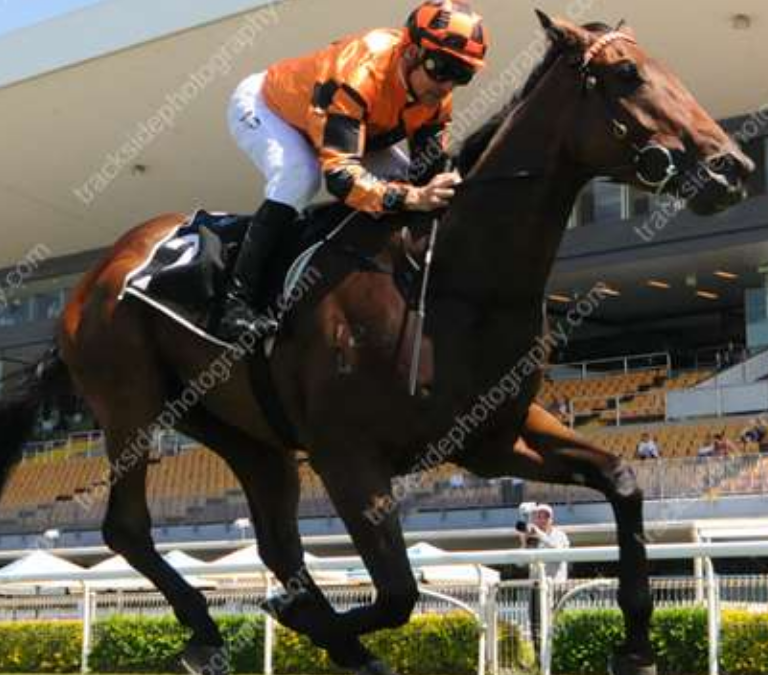 3 wins from 1550m to 2400m, A$518,165, Queensland Derby, Gr.1, AJC Frank Packer P., Gr.3, STC Inglis H., 2d MRC Underwood S., Gr.1, 3d BRC Doomben Roses, Gr.3. Macduff (Machiavellian). 5 wins from 1m to 1¼m, €16,733, US$220,569 in Ireland and U.S.A, Hollywood Park Allowance, Santa Anita Allowance, 3d Golden Gate Breeders' Cup S., Gr.3, Bay Meadows Breeder's Cup H., Gr.3, 4th Del Mar Cougar II H., L, Oak Tree War Chant S., L.
MOON CREST (Admire Moon). 7 wins-1 at 2-from 1400m to 3000m, 154,708,000¥, to 2018, Hanshin Port Island S., L, Kyoto Kiyomizu S., Chukyo Chita Tokubetsu, Kyoto Omi Tokubetsu, 2d Hanshin Chushu S., Miki Tokubetsu, 3d Hanshin Osaka-Hamburg Cup, L, Maiko Tokubetsu, 4th Tokyo Principal S., L.
KASMAYO (Slip Anchor). 2 wins at 11¾f, 1½m, Doncaster Troy S., L. Sire. EILEEN JENNY (Kris). 2 wins at 2400m, Milan Premio Giovanni Falck, L, 3d Irish Oaks, Gr.1, Curragh Meld S., Gr.3, Naas Lapis S., L. Producer. CAPTIVATOR (Artaius). 2 wins at 1m, Phoenix Park Pas de Seul S., L, 2d Curragh Desmond S., Gr.3. BEAT HOLLOW (Sadler's Wells). Champion 3YO in France in 2000 (Int.). 7 wins-1 at 2-from 1600m to 2000m, £135,984, 1,200,000fr., US$1,437,150, Churchill Downs Turf Classic S., Gr.1, Longchamp Grand Prix de Paris, Gr.1, Belmont Manhattan H., Gr.1, Arlington Million S., Gr.1, Newmarket S., L, 2d Del Mar Eddie Read H., Gr.1, Fair Grounds Explosive Bid H., Gr.2, 3d The Derby, Gr.1, Keeneland Turf Mile S., Gr.1. Sire. YARALINO (Caerleon). 4 wins from 1m to 1¼m in GB and U.S.A, Golden Gate Tanforan H., Gr.3, Santa Anita Allowance, 2d Golden Gate Lafayette H., L.
GLOWING (Dansili). 3 wins-1 at 2-at 7f, 1m, €81,696, Fairyhouse Brownstown S., Gr.3, 4th Leopardstown Nijinsky S., L. Producer. DUCK FEET - LEVEL PLAYER (H.K.) (Aussie Rules). 6 wins-4 at 2-from 1500m to 2200m, Rome Premio Guido Berardelli, Gr.3, Milan Premio Vittorio Riva, L, HKJC Centenary Cup, Milan Premio delle Aste, HKJC Lantau Peak H., 3d HKJC Sight Winner H.
VACAMONTE (Caerleon). 2 wins-1 at 2-at 7f, 1m, Newmarket Superlative S., L, Del Mar Allowance. New Abbey (Sadler's Wells). 2 wins at 11f, 1½m, 2d Ascot Princess Royal S., Gr.3, 3d Ascot Harvest S., L. Producer. BELLAMY CAY (Kris). 7 wins from 2000m to 4100m, €313,384, Longchamp Prix Maurice de Nieuil, Gr.2, Prix d'Hedouville, Gr.3, Saint-Cloud Prix de la Porte de Madrid, L, Deauville Prix Vulcain, L, Longchamp Prix de Lormoy, Prix du Roule, 2d Longchamp Prix Royal Oak, Gr.1, 3d Grand Prix de Chantilly, Gr.2, Saint-Cloud Prix Bay Middleton, 4th Grand Prix de Deauville, Gr.2. NEW BAY (Dubawi). Champion 3YO in France in 2015 (Int.). 5 wins from 1600m to 2400m, €1,969,230, Chantilly Prix du Jockey Club, Gr.1, Deauville Prix Guillaume d'Ornano, Gr.2, Longchamp Prix Niel, Gr.2, Deauville Prix Gontaut-Biron, Gr.3, Longchamp Prix Machado, 2d Longchamp Poule d'Essai des Poulains, Gr.1, Chantilly Prix de Trossy, 3d Longchamp Prix de l'Arc de Triomphe, Gr.1, 4th Leopardstown Irish Champion S., Gr.1. REEFSCAPE (Linamix). Champion 3YO Stayer in France in 2004. 6 wins from 2400m to 4000m, £79,406, €521,685, HK$250,000, Longchamp Prix du Cadran, Gr.1, Prix Chaudenay, Gr.2, Prix Gladiateur, Gr.3, Prix de l'Avre, L, Chantilly Prix du Connetable, 2d Royal Ascot Gold Cup, Gr.1, Longchamp Prix Royal Oak, Gr.1, Prix Ganay, Gr.1, Deauville Prix Kergorlay, Gr.2, Longchamp Prix de Lutece, Gr.3, Deauville Prix de Reux, L, 3d Epsom Coronation Cup, Gr.1, Longchamp Prix Vicomtesse Vigier, Gr.2, Prix de Barbeville, Gr.3. Sire. COASTAL PATH (Halling). Champion 3YO Stayer in France in 2007. 6 wins from 2400m to 3100m, £26,925, €282,350, Longchamp Prix Chaudenay, Gr.2, Prix Vicomtesse Vigier, Gr.2, Prix de Barbeville, Gr.3, Prix de Lutece, Gr.3, Deauville Prix de Troarn, 2d Longchamp Prix d'Hedouville, Gr.3, 3d Royal Ascot Gold Cup, Gr.1, Deauville Prix Kergorlay, Gr.2. Sire. MARTALINE (Linamix). 5 wins-1 at 2-from 1450m to 2800m, £5,000, €232,525, 90,576fr., Maisons-Laffitte Prix Maurice de Nieuil, Gr.2, Longchamp Prix d'Hedouville, Gr.3, Deauville Prix de Reux, L, Prix de Quetieville, 2d Longchamp Prix Foy, Gr.2, Grand Prix de Deauville, Gr.2, Grand Prix de Chantilly, Gr.2, Deauville Prix Michel Houyvet, L, 3d Saint-Cloud Prix Jean de Chaudenay, Gr.2, Chantilly Prix La Force, Gr.3. Sire. GOBI DESERT (Oasis Dream). 2 wins at 2, Navan Legacy S., L, Curragh Irish Stallion Farms 2YO S., 2d Fairyhouse Blenheim S., L.
DOHA DREAM (Shamardal). Champion 3YO Stayer in France in 2016. 5 wins from 2200m to 3000m, €310,500, Chantilly Prix Chaudenay, Gr.2, Nantes Derby de l'Ouest, L, Vichy Prix Frederic de Lagrange, L, Saint-Cloud Prix des Orfevres, 2d Grand Prix de Deauville, Gr.2, Deauville Prix de Reux, Gr.3, Longchamp Prix de Barbeville, Gr.3, Lyon-Parilly La Coupe des Trois Ans, L, Longchamp Prix de la Sorbonne, 3d Chantilly Prix Niel, Gr.2. SPANISH DON (Zafonic). 7 wins from 1600m to 2000m, £141,195, 188,000fr., Newmarket James Seymour S., L, Totesport Cambridgeshire H., 2d Chantilly Prix de Pontarme, L, Prix de Saint-Patrick, L.
OASIS DREAM (Green Desert). Champion 2YO in Europe & GB in 2002. Champion Sprinter in Europe in 2003. Champion 3YO Male Sprinter in GB in 2003. . 4 wins-2 at 2-at 5f, 6f, £433,737, Newmarket July Cup, Gr.1, Middle Park S., Gr.1, York Nunthorpe S., Gr.1, 2d Haydock Sprint Cup, Gr.1, Sandown Alliance Capital 2YO S., 3d Royal Ascot King's Stand S., Gr.2. Successful sire. KINGMAN (Invincible Spirit). Horse of the Year & Champion 3YO Colt in Europe in 2014. Leading 3YO Male on the 2014 WTR (Mile). Champion 3YO Miler in France, GB & Ireland in 2014. 7 wins-2 at 2-from 1400m to 1600m, £540,134, €516,840, Deauville Prix Jacques Le Marois, Gr.1, Royal Ascot St James's Palace S., Gr.1, Goodwood Sussex S., Gr.1, Irish Two Thousand Guineas, Gr.1, Newbury Greenham S., Gr.3, Sandown Solario S., Gr.3, Newmarket Bet365.com 2YO S., 2d The Two Thousand Guineas, Gr.1. Sire. REMOTE (Dansili). 3 wins from 1m to 1¼m, Royal Ascot Tercentenary S., Gr.3, Doncaster Ladbrokes Download the App H., Newbury Betfred TV S. Sire. HOPEFUL LIGHT (Warning). 4 wins-1 at 2-at 7f, 1m, Newmarket Joel S., L, Salisbury Sovereign S., L, Doncaster Ciswo S., 4th York Strensall S., L.
FRACAS (In the Wings). 5 wins at 1¼m, £91,500, €283,139, US$20,000, Leopardstown Derrinstown Stud Derby Trial S., Gr.2, Meld S., Gr.3, Sandown Classic Trial S., Gr.3, Curragh Silver S., L, Leopardstown Golf Centre S., 2d Cologne Rheinland Pokal, Gr.1, Curragh Moorebridge S., Gr.3, Leopardstown Ballyroan S., Gr.3, Curragh Alleged S., L, Fairyhouse Diamond S., L, 4th The Derby, Gr.1. Sire. Tregaron (Lyphard). 3 wins at 7f, 1m, Ascot Insulpak Victoria Cup H., White Rose H., 2d Lingfield Silver Trophy, L.
Ezy Koter (Lomond). 2 wins at 1¼m, 11f, Phoenix Park 110B Kingston H., 2d Down Royal Ulster Harp Derby, L. Sire. Woodwin (Woodman). Winner at 1m, 3d Leopardstown One Thousand Guineas Trial, L. Producer. I'LL HAVE ANOTHER (Dragon Pulse). 3 wins at 2 in 2018 in GB and Germany, Cologne Preis des Medienhauses Dumont Rheinland, L, 2d Baden-Baden Zukunfts Rennen, Gr.3, Newmarket Zetland S., L, 3d Pontefract Silver Tankard S., L.
LA COLLINA (Strategic Prince). 3 wins-2 at 2-from 6f to 1m, £23,928, €316,770, Leopardstown Matron S., Gr.1, Curragh Phoenix S., Gr.1, 2d Curragh Ridgewood Pearl S., Gr.3, Leopardstown Silver Flash S., Gr.3, Naas Blue Wind S., Gr.3, 3d Curragh Moyglare Stud S., Gr.1, Gladness S., Gr.3, 4th Newmarket Sun Chariot S., Gr.1, Curragh Dance Design S., Gr.3. ENTSAR (Fastnet Rock). 3 wins from 1¼m to 10¼f, York Lyric S., L, Newbury Karl King Transport Fillies' H., 3d Nottinghamshire Oaks, L, 4th Newcastle Hoppings S., L.
MOONLIT SHOW (Showcasing). 2 wins at 2, Fairyhouse Blenheim S., L.
HERO'S HONOUR (Await the Dawn). 3 wins at 1600m, 2450m, R1,425,713, to 2018-19, Turffontein South African Derby, Gr.1, Classic Day in March Assessment P.
DECADO (Danehill Dancer). 4 wins-1 at 2-at 7f, 9f, £4,050, €215,389, US$10,960, Curragh Tetrarch S., Gr.3, International S., Gr.3, Loughbrown S., L, 3d Irish Two Thousand Guineas, Gr.1, Curragh Royal Whip S., Gr.2, Leopardstown Amethyst S., Gr.3. Sire. West China (Habitat). 4 wins from 1¼m to 17f, 2d Phoenix Park Johnny Jones Trial, L, 3d Chester Ormonde S., Gr.3. Sire. Beldarian (Last Tycoon). 3 wins. See above. Barlagarney (Danehill). 6 wins from 1600m to 2000m, A$361,145, AJC UD Trucks H., 2d Murrumbidgee TC Wagga Gold Cup, L, Gosford Cup, L, 3d VRC Maribyrnong P., Gr.3. Race Record: 14 Starts 1-1-4 A$50,100. Winner at 1350m in 2017-18, BRC Mount Franklin H., 3d BRC James Boag's Premium H., SCTC Coastline BMW M2 H., GCTC Aquis Farm on Youtube.com, Subscribe to Aquis Farm P.